Disclaimer: that is NOT our bathroom, I just don't have a shot of ours before. That's the same kind of shower door we have though. A whole new shower is out of the budget, and even new shower doors are $$$ ($400+ for the cheapest that would fit our surround). However, I found a Krylon Satin finish spraypaint a few weeks ago, and decided to give it a try. I got the Brushed Nickel since it is the finish we've used throughout the house with new lighting and faucet fixtures, door knobs, etc. We removed the shower door and frame from the bathroom, and I scrubbed it and used a razor blade to remove any caulking left over. I started first on the frame, putting a coat on all 4 sides of the bars. While the spraypaint on the frame dried, I removed the towel bars from the doors and covered the glass on both sides with paper. Before paint, and with the paint. I love the look of this finish. Its slightly darker gray than the chrome, and looks smooth and elegant. Not cheap and shiny or blotchy at all. I also decided to leave off the towel bars. Instead, I placed silver knobs on the outside of the doors, and re-used the plastic block pieces for the middles. It should give a cleaner, more modern look to the shower once it is back in place. We love it, it looks much more "finished" and modern. Oh I can't wait what a clever thing that was! Thanks for the idea! LOVE IT! *squealing with delight* something within our budget! YEAH! Do you think you can use this on door knobs, etc? Those look great. I need to do the same thing since we have the same doors. It looks great! I am amazed what people do with spray paint! Am wondering how the shower door frame is holding up? Thanks!! how did this hold up??? 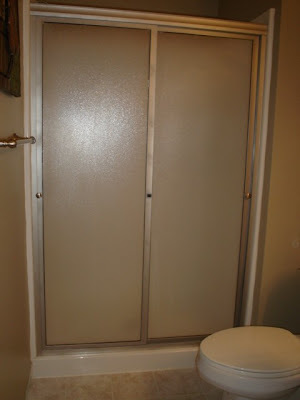 I am thinking about doing the same thing to my shower door....but in bronze. I wouldn't have done this. 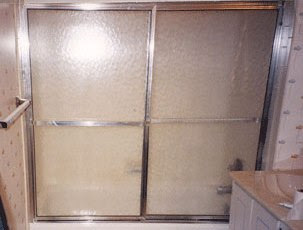 Now your shower door frame looks blotchy and definitely "homemade" even in a zoomed out blurry picture. And without some sort of clear coat on top of the metallic this finish probably went down hill after a few months. I was thinking of using this paint for a quick project, but now am reconsidering given the average DIYer results.